SafeMedicationUse.ca - Alerts - Reminder: Take Care with Clear Care! Reminder: Take Care with Clear Care! Figure 1. Clear Care carton, bottle and special contact lens case. Clear Care contains 3% hydrogen peroxide, which can cause pain and burning if it comes into contact with the eyes. Clear Care is packaged with a special lens cleaning case. When the product is used with the special case, the hydrogen peroxide is neutralized to a solution that is safe for the eyes. Unfortunately, SafeMedicationUse.ca continues to receive reports from consumers who have experienced harm after improper use of Clear Care. For example, one consumer confused Clear Care with a multi-purpose contact lens solution and used it to clean lenses in a flat lens case. This prevented the hydrogen peroxide solution from being neutralized, and the consumer experienced pain and burning after placing a contact lens in the eye. Another consumer reported that Clear Care was used to rinse lenses directly before placing them in the eyes. The Institute for Safe Medication Practices in the United States has received similar reports and has published alerts warning consumers of the chance of harmful mistakes with Clear Care. Read more In the United States, the manufacturer has made several changes to the packaging and labelling in an attempt to prevent these problems. However, to date, similar packaging changes have not been adopted in Canada. ISMP Canada has communicated ongoing concerns about the potential for mix-ups to the manufacturer and to Health Canada. Do not assume that all contact lens solutions are the same; check packaging carefully for details. Before removing your lenses for cleaning, carefully read the instructions for using the product you have selected. Follow the product instructions carefully, step by step. 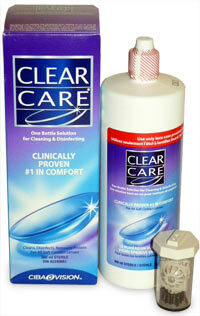 If you are using the Clear Care product, always use the lens case provided with the product. Store lens cleaning solutions containing hydrogen peroxide separately from solutions used to rinse or moisturize your lenses. Be sure to use your contact lens cleaning solution properly and safely--doing so could save you from a very painful experience!